Dinosaur Ridge is the site of one of the world’s earliest major dinosaur discoveries – the first bones of an enormous, plant-eating dinosaur that would be called the Apatosaurus and would stand for decades as the largest of the giant reptiles. The dinosaur was named and described in 1877 based on the fossils found on the ridge earlier that year by Arthur Lakes, a Golden schoolteacher who became a professor at the Colorado School of Mines. Lakes also discovered the first bones of the Stegosaurus, a smaller plant-eating dinosaur with a protective plates and a spiked tail thought to have been used for defensive purposes. The Stegosaurus also was described and named in 1877, and it became the official State Fossil in 1982. Also uncovered on the site were the skeletal remains of an Allosaurus, a meat-eating predator, and a Diplodocus, another plant-eater. The dinosaurs lived in the Jurassic period about 150 million years ago. The dinosaur bones that Lakes found were in a hogback of sandstone and mudstone left on the shores of ancient waterways that once covered the area. That geologic layer, which proved to be a rich source of dinosaurs throughout the West, was named the Morrison Formation after the nearby town. Lakes sent Apatosaurus and Stegosaurus bones to paleontologist Othniel Marsh of Yale University’s Peabody Museum, who named the dinosaurs and published descriptions of them in a scientific journal. Two years later, Marsh gave the name Brontosaurus to a skeleton recovered from Wyoming, but it was later determined to be an Apatosaurus. The name Brontosaurus was the most popular with the public for decades but was gradually supplanted by Apatosaurus, the official name for the species. An Apatosaurus typically was 72 feet long, weighed 20 to 35 tons and stood on four stout legs to support its massive body, long neck and tail. It had a remarkably small skull. A Stegosaurus typically was 30 feet long, stood 14 feet high and weighed five tons. It also had a small skull. The discovery of the Apatosaurus and Stegosaurus fossils spurred the “Bone Wars” between Marsh and a competing paleontologist as they fought to be the first to name and describe newly discovered dinosaurs, many of them in Colorado. It also led to a Dinosaur Rush that resembled the Gold Rush as explorers studied the geology, dug in promising areas and sometimes found pay dirt in the form of skeletal remains of the great reptiles that could be sold to museums. Dinosaur Ridge gained fresh attention in 1937, when dinosaur tracks were discovered during the construction of the West Alameda Parkway. The 300 tracks were in the Dakota Formation, which was formed in the early Cretaceous period about 100 million years ago. 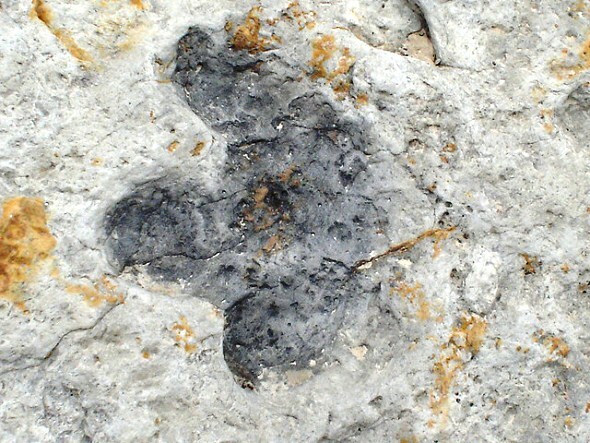 The tracks are from Iguanodon-like plant-eating dinosaurs and ostrich-sized meat-eating dinosaurs that traveled a “Dinosaur Freeway” along the shores of an ancient sea that extended from Boulder to northern New Mexico. The site, which is run by the nonprofit Friends of Dinosaur Ridge, offers a 1.5-mile trail that traverses the hogback, allowing visitors to see a quarry for dinosaur bones, hundreds of dinosaur tracks and geological features. There are guided and self-guided tours, and the trip takes one to two hours. The Dinosaur Ridge Discovery Center opened in Red Rocks Park in 2014. A ranch house and barn serve as the gift shop and visitor center, which offers the Trek Through Time exhibit that is popular with schoolchildren. The ridge is part of the Morrison-Golden Fossil Areas Natural National Landmark, which also includes the Triceratops Trail near the Colorado School of Mines and the Fossil Trace Golf Course. The Morrison Natural History Museum nearby has Stegosaurus bones from Dinosaur Ridge in its collections.